"But soft, what light through yonder window breaks?" So, to recap: in a learning setting - a classroom, an agile space, a homework bedroom, a boardroom, coaching space, wherever, you need good light for your brain to work well. Outdoor light is often up in the many thousands of Lux but indoors you at least need to be over 500 lux. 1,000 lux would be a good target, but 500 will do. Below that learners lose attention, engagement, recall and more. Their bahaviour and performance are noticeably worse. Elsewhere you can read more - see our Learnometer.net pages, or this on paint. Painting the walls and ceilings with bright Lumitec white paint helps, so do light desktops and you need to get all the paper off your glass windows too. This page concerns the lighting. Beyond getting the best outside light into your space, and making sure it gets reflected around in there, rather than absorbed, your friend here is LED lighting. It is cheaper to run that the old fluorescent tubes, the light quality is dramtically better, and it is easy to fit - or retro fit - LED bulbs these days. A caveat would be that rooms were historically often underlit - so changing bulbs is good, but adding more lights may be necessary too. This is a quick win in terms of cheapness and impact on brains & behaviour. In short, better light from these bulbs, once you get above 500 lux for everyone, will translate into enhanced cognitive task performance and saves money (and the planet!). What is the ideal white light? Not quite as straightforward as you might hope. In simple terms, you are seeking the "coolest" white liight (but caution, see below. The cool or warm description refers to how they look - blue ice is cool, a yellow sunshine is warm. Nothing to do with actual temperature of the bulbs. So just a note of caution, the ones they call "Cool white" are not the coolest! Natural or dayligh is what you seek and they ARE the coolest. Some folk find the slightly blue tinge at the 6,500 K end of this a bit off-putting, some like it a lot, but anywhere within this "daylight range" is good. Really look aound your space in planning, to leave no dark corners. Spots can be too narrow and you end up with little puddles of good light - the bulbs above have a beam angle of 120° and look out for these wider beams. Sometimes people tell me that they have a group of "naughty" children in a corner of their class, but typically the kids are fine, it's the room that disengages them. However, in painting all the walls very white and fitting daylight white LEDs it might be argued that it's all a bit anodyne. Again, LEDs come to your rescue. LED strips around the top of your walls can bring variety and interest - seek strips that can do colour change and have controls for that easily reached and labelled. Research suggests that red wakes you up in the mornings (hence red all over BBC breakfast TV) but other colours really just bring variety = interest. This classroom wall below is indicative - read about that whole class makeover from Juliette Heppell's (free) iBook. 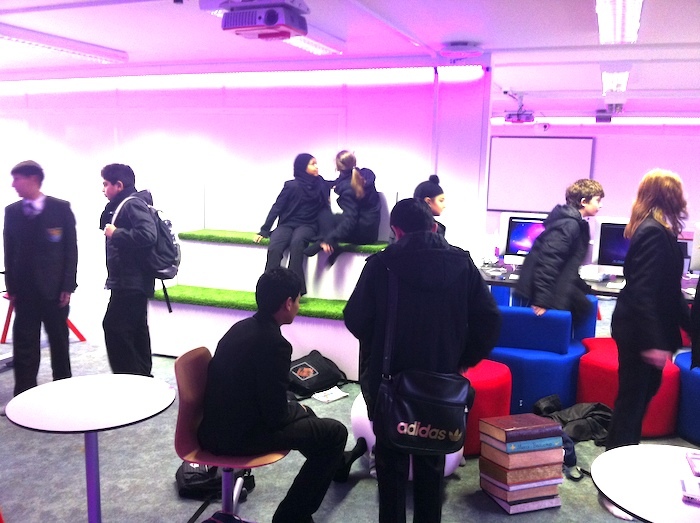 The students chose the colour strips, change them during the day, and called them mood lighting. But above all else, get those Lux levels up in every corner of your learning space.